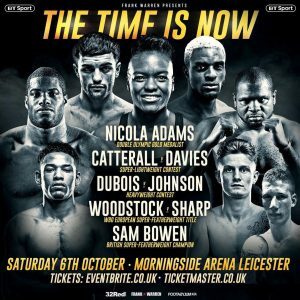 This coming Saturday the Leicester Arena will play host to a super-lightweight showdown between Jack Catterall and Ohara Davies – two contrasting personalities with Catterall typically calm, composed and business-like and Davies the flamboyant and brash counterpart. All that seems to have been changing over the past few months with Ohara Davies retiring his former persona, OD, and seeking to rebuild a reputation that, at one point, saw him labelled the most hated boxer in Britain. As part of Frank Warren’s ‘The Time is Now’ card, this 10 round contest is slated for the WBO Inter-Continental and WBC International belts and the evenly matched bout looks set to be an absolute barnstormer. Catterall has looked like a new fighter since he teamed up with Jamie Moore and the Inter-Continental champion had to dig deep back in June to navigate his way past a gritty Tyrone McKenna – in McKenna’s back garden – but the 25 year old showed plenty of heart and grit to secure a points victory and also show that he’s got multiple facets to his game. Davies, on the other hand, a week prior to Catterall vs Mckenna, bagged himself a showcase knockout against Paul Kamanga, to claim his WBC strap, with a peach of a right hand that sent his Congolese opponent slamming to the canvas. On paper Ohara is the more explosive fighter with a more continuous punch output but Catterall packs a serious punch and when he starts to work the body of his opponent, you can tell they are in trouble. Technically you’d back Jack with his mental fortitude perhaps standing him in better stead – indeed he is tactically astute with the ability to remain patient before enforcing a tempo his own. The winner of this bout moves to pole position for a world title shot, jumping to the front of the queue, whilst the loser, and there is no shame in losing such a fight, will be knocking on the door for an immediate rematch – BRING IT ON! Nicola Adams, the lioness from Leeds, will fight for the interim WBO flyweight title against Isabel Millan over the course of 10 two minute rounds with the ultimate aim being to fight Raja Amasheh, for the full title, by the end of 2018. A genuine pioneer of female boxing, the two-time Olympic champion has kept level-headed throughout her opening four fights and although she hasn’t fought as frequently as she would have hoped, Adams is wasting no time in stamping her authority at the top of her division. Back in May she faced Soledad del Valle Frias, a former world title challenger, with ability far better than her 13-11-4 record, at the time, suggested. There was mild controversy as the timekeeper believed the bout was set for three minute rounds but Adams showed blistering hand spend and relentless power to force the stoppage within the first round. This is a fight that, let’s not make bones about it, Adams should win in routine fashion and if you look at the makeup of the women’s fly and super-fly divisions there are very few fighters who you wouldn’t have Adams as favourite to beat – if, indeed, any – and that’s a strong testament to her amateur pedigree and sublime skills in the ring. Daniel Dubois will be in his ninth professional contest on the undercard as he takes on Kevin Johnson, a seasoned veteran, and whilst Johnson is past his prime – the bell probably rang on that in 2010 – to an extent that he can’t even be considered a gatekeeper anymore, I like that everyone around Dubois is openly admitting that he needs rounds and they’re guiding him in a patient fashion. With that in mind you can’t really complain as to the quality of opposition he’s fighting because if you look at the likes of Tyson Fury, Anthony Joshua, Dereck Chisora, all the way throughout British heavyweights in history, he’s not at a shabby level of development by any stretch of the imagination. Lest we forget that Johnson extended Andy Ruiz Jr to a full 10 rounds earlier this year so the chin of Kingpin is still in solid nick and if we are to believe that Dynamite is the real then he’ll be looking to explode into life with a devastating knockout over his American counterpart. Lyon Woodstock vs Archie Sharp is a fight that you just need to say fair play to both guys for taking on the contest when they could have had far easier contests but there’s no messing around from either guy and the two will produce a sumptuous display for the fans on October 6th. What more could you ask for in a fight night? Terrific action and prospects promised in every fight so let’s have it!